I noticed Anthony Watts and Judith Curry getting quite excited by a new paper from Emma Suckling and Leonard Smith called An Evaluation of Decadal Probability Forecasts from State-of-the-Art Climate Models. The paper was basically a comparison of an ensemble of dynamical climate models (GCMs) and empirical models. The basic conclusion was that empirical models are, statistically, better at decadal forecasts that dynamical climate models. I was initially quite positively inclined towards this paper, but the more I’ve thought about it, the more critical I’ve become. Having said that, it’s always possible that I’ve missed some subtlety or misunderstood some aspect of the paper. Hence, I’m happy to be corrected by anyone who knows more than me. The core figure is probably the one I show below. 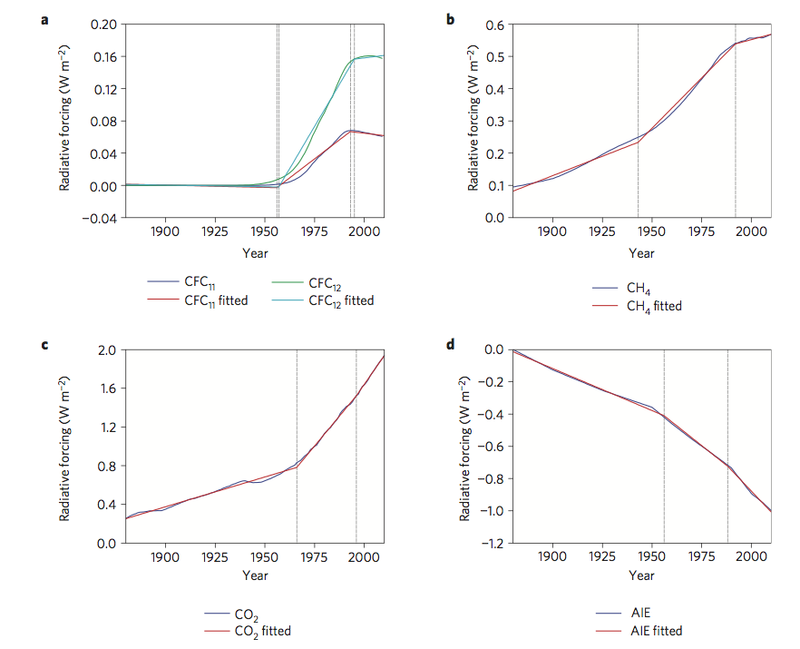 The left-hand panel shows decadal projections for the ensemble of dynamical climate models, while the right-hand panel is for the empirical models. Forecasts are launched every 5 years and so the two panels on each side are simply to split the forecasts as they would overlap if they were in the same figure. 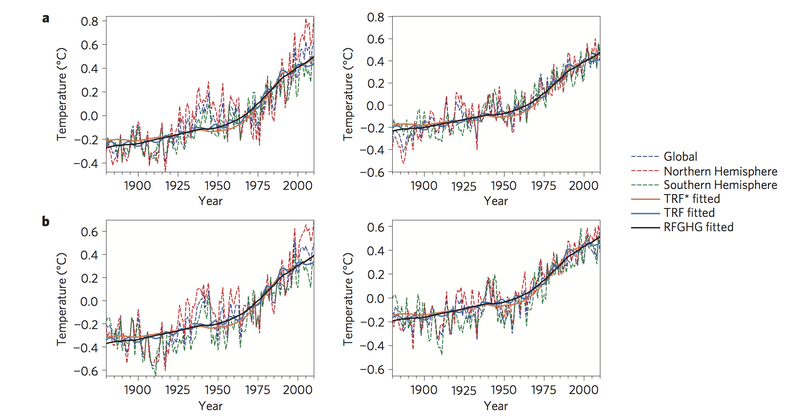 Decadal forecasts from dynamical climate models (left-hand panel) and empirical models (right-hand panel) (credit : Suckling & Smith 2013). If I understand the rest of the paper, it is essentially an analysis that indicates that – when considering decadal forcasts – the empirical models outperform the dynamical climate models. So, what are my issues with the paper? As far as I understand it, dynamical climate models are extremely complicated. They consider the oceans, land, atmosphere, polar regions, can consider both regional and global climate, and they can do more than simply consider surface temperatures. All this study seems to have done is compare global surface temperatures from these two types of models. Unless I misunderstand something, these empirical models can do virtually nothing else. It’s not really a like-for-like comparison. They’re not really considering two models that can do the same things. They’re comparing a very simple model that can do only one thing, with one aspect of a very complicated model. Another issue is that if I consider the right-hand panel in the figure above, then it appears that if you were to overlay the top and bottom panels, there would be quite sharp discontinuities at a number of the 5-year launch points. There appears to be an element of this for the dynamical climate models, but it does not appear quite as severe. This would seem to indicate that the empirical models would do a very poor job if used to forecast more than a decade. Additionally, most of the papers cited when discussing the empirical models were written in the 2000s. The comparison, however, starts in 1960. Given that one would expect these empirical models to have been developed based on past knowledge, it would remarkable if they didn’t do a very good job of forecasting the period from 1960 to 2000. You might argue that that’s true for dynamical climate models and there, presumably, is some merit to this suggestion. Dynamical climate models are, however, constrained by the laws of physics. Empirical models, I believe, are not. Given that there are no such constraints on empirical models, it would be pretty amazing if people developing empirical models in the 2000s did not ensure that they were particularly good at forecasting the period prior to 2000. It also calls into question the extent to which current simulation models successfully capture the physics required for realistic simulation of the Earth system and can thereby be expected to provide robust, reliable predictions (and, of course, to outperform em- pirical models) on longer time scales. I find this a little bit of an odd statement. Unless I’m mistaken, empirical models have no physics and so they seem to be concluding that dynamical climate models may not have captured all the physics needed because they’re outperformed by models with no physics at all. It may well be that dynamical models do not have all the necessary physics, but it’s not clear why such a comparison is needed to know this. A comparison with actual observations would tell you this. Also, this study has only considered one aspect – surface temperatures – of dynamical climate models. Dynamical climate models are also used for more than just making forecasts. They’re being used to try and understand the climate and how it evolves, and also to consider different future emission pathways. Empirical models, I believe, can do none of this. The blending (Broecker and Smith 2008) of simulation models and empirical models is likely to provide more skillful probability forecasts in climate services, for both policy and adaptation decisions. This may well be true. There may well be policy decisions we might want to make based on decadal forecast and so empirical models may well play an important role here. So, I’m certainly not suggesting that empirical models have no role, just that I’m unclear as to the value of the kind of comparison done in this paper. I have been rather critical of the paper so, again, if someone thinks I’ve misunderstood it, or missed something important, feel free to point it out through the comments. Something I haven’t touched on is how other’s have interpreted it. There is already some evidence that some interpret this as implying the empirical models are better than dynamical climate models. Given that dynamical climate models do much more than simply consider surface temperatures, this interpretation is – in my opinion at least – incorrect. I also find it interesting that these type of papers (i.e., statistical analysis of climate models) often seem to come from people associated with economics, rather than from climate modellers themselves (I commented on something similar a while ago). I appreciate that the authors of this paper have physical science backgrounds, but I’d be fascinated to know what climate modellers actually think of these papers. Do they find them useful and interesting, or do they – secretly – find it frustrating that some think that the way to assess climate models is through statistical analyses rather than through checking how well they satisfy the fundamental laws of physics? Anyway, there’s probably more that could be said but I’ll stop there. I really like Allen’s idea. It solves the problem without the need for a complex tax or emissions trading scheme; it puts the responsibility squarely where it belongs: with the fossil fuel companies themselves; and if the challenges of deploying carbon capture and storage technology increase the cost of fossil fuels – as will likely happen – then it will make carbon-free energy sources much more competitive and that is surely what we want. The other advantage I can see is that regardless of how we solve this problem, we *need* carbon capture and storage. Atmospheric CO2 is already at 400ppm and humans in the future may decide that we need to go back to 350ppm. Allen is going to get lots of criticism for this article. One criticism will be that he has stepped over the line from science into policy. I don’t have any objections with him stepping over this line. I *want* climate scientists to take a more active role in policy decisions that are related to climate change. They are the ones who understand the problem better than anyone else and so it follows that they know better than anyone else what needs to be done to solve it. We need solutions coming from the people who understand the problem. As Allen points out, the economic solution – pricing carbon – is not going to solve climate change unless emissions are reduced to zero. Furthermore, Universities and the people who work in them play a role in society known as critic and conscience. This means that academics have an implied duty to criticise aspects of society and they should be allowed to do this without fear of repercussions. This is recognised by law in New Zealand under the Education Act 1989 which says, they [universities] accept a role as critic and conscience of society. These aspirations are based upon a number of features. The first is that universities have a responsibility towards society, to work for what they view as the good of society, even at the cost of passing judgement on aspects of that society. To function in this manner, dialogue has to occur between universities and society, dialogue that will only be possible if university staff act with integrity and if this integrity is widely respected outside universities. Implicit within this role of universities is the freedom of academic staff to critique ideas both within and beyond the universities themselves. This freedom is to be exercised by academic staff, both directly and indirectly: directly, for the good of their academic disciplines, and indirectly, for the good of society. As such, it appears to be a highly specific kind of freedom, with clearly articulated boundaries, determined by the academic expertise of the staff and the close relationship between this and their areas of responsibility within the university. Reiner Grundmann has posted, on Die Klimazwiebel, a video from the IPCC that summarises the Working Group 1 report. I watched it and thought it was alright. Seemed to do a pretty good job of presenting the scientific evidence. Reiner asks, in his post, how well this video communicates the basic science and whether or not it manages to do so in a policy neutral way, while still being policy relevant. I’d be interested in what those who read this blog think of this video. Might be fun to compare the comments here with those on Die Klimazwiebel. Could be somewhat revealing. Watts Up With That (WUWT) has a recent post by Christopher Monckton called On CO2 residence times – the chicken or the egg. Ths post discusses the bombtest curve shown in the figure below. 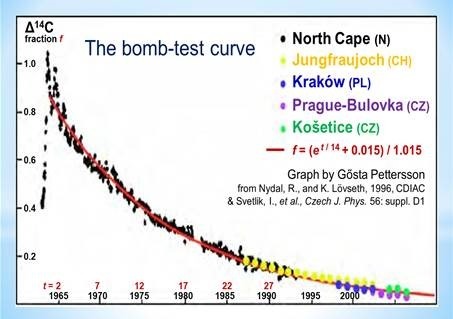 This curve shows the decay of atmospheric 14C after the end of nuclear testing. It shows a half life of around 10 years and that most is gone within 50 years. The conclusion that is drawn (based on some earlier work by Gosta Petterson) is that this implies that the enhanced atmospheric CO2 concentration (resulting from anthropogenic emissions) should disappear within a few decades rather than over hundreds of years, as claimed by the IPCC. I’ve already discussed this in an earlier post, so won’t go into too much detail here. The basic point is, though, that what Gosta is confusing is the residence time of an individual molecule (which is indeed only a few years) with the time it would take for an enhancement to decay [Amendment : Not only is my interpretation here a bit simplistic, but I believe that Gosta Petterson has also acknowledged an error in his first calculation. See the comments by Lars Karlsson for details]. An individual molecule will only stay in the atmosphere for a few years before being absorbed by the biosphere or the oceans. It is, however, typically replaced by another molecule from the biosphere and oceans and so, on short timescales, this carbon cycle doesn’t change the atmospheric concentration. So, I think Mr Born is pointing out that the bombtest curve is telling us something about the residence time of individual molecules, not the timescale over which a concentration enhancement would decay. It is because the consequences of this research are so potentially important that I have set out an account of the issue here at some length. It is not for a fumblesome layman such as me to say whether Professor Pettersson and Professor Salby (the latter supported by Professor Lindzen) are right. Or is Mr. Born right? If I’ve understood what Mr Born is saying, then the answer to this question is Yes. There’s a recent post on Watts Up With That (WUWT) called the 97% consensus myth busted by a real survey. It discusses a recent paper that reports on Meteorologists’ views about global warming. The survey was of all American Meteorologial Society (AMS) members who had email addresses. What’s got Anthony excited is that – as shown in the table below – of those who responded, only 52% agreed that global warming was primarily caused by humans. H1: As compared with professionals with less expertise in climate change, professionals with more expertise will have higher levels of personal certainty that global warming is happening. H2: As compared with professionals with a more conservative political orientation, professionals with a more liberal political orientation will have higher levels of personal certainty that global warming is happening. H3: As compared with professionals who perceive less scientific consensus about global warming, professionals who perceive more scientific consensus will have higher levels of personal certainty that global warming is happening. H4: As compared with professionals who perceive less conflict about global warming within the membership base of their professional society, professionals who perceive more conflict will report lower levels of personal certainty that global warming is happening. Confirmation of our four hypotheses shows that meteorologists’ views about global warming observed in the last 150 years are associated with, and may be causally influenced by, a range of personal and social factors. 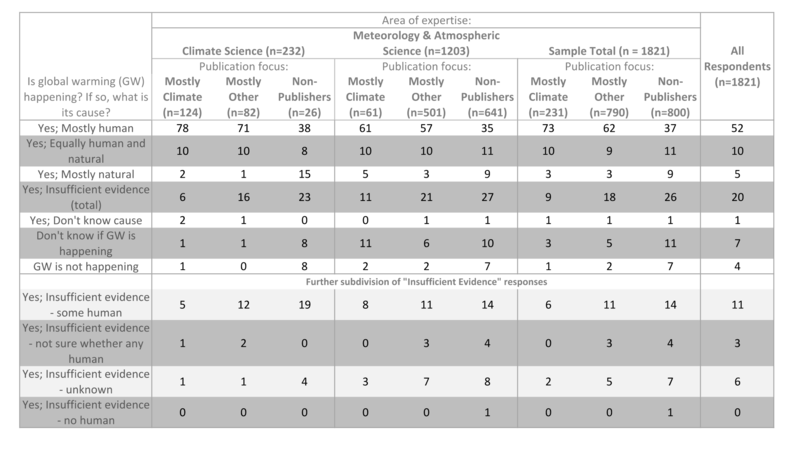 In other words, the notion that expertise is the single dominant factor shaping meteorologists’ views of global warming appears to be simplistic to the point of being incorrect. As far as I can tell, the survey does indeed show that only around 52% of AMS members accept AGW but this is more because of their particular expertise, their political views, their views with respect to consensus, and whether or not they perceived significant conflict about the topic. It doesn’t imply anything with respect to AGW itself other than the AMS should probably do something about how climate science is communicated to its members. To finish I thought I would highlight this relevant, but possibly controversial, post by David Appell called climate scientists are the opposite of weathermen. [i]f green technology could be cheaper than fossil fuels, everyone would switch, not just a token number of well-meaning rich nations. We would not need to convene endless climate summits that come to nothing. A smart climate summit would encourage all nations to commit 0.2 per cent of GDP – about $100 billion globally – to green R&D. This could solve global warming in the medium term by creating cheap, green energy sources, that everyone would want to use. In a few simple sentences, Bjorn has illustrated the problem with what we’re currently doing. The problem is clearly that green activists have been advocating for renewable technologies that are more expensive than fossil fuels, rather than advocating for renewable technologies that are cheaper than fossil fuels. It seems obvious now that Bjorn’s explained this, so it really is amazing that this wasn’t realised earlier. It’s ideas like this that illustrate why Bjorn is regarded by some as one of today’s leading thinkers. It’s also made me wonder if there are any other revolutionary, but simple, ideas that noone’s thought of before. I’m not in the same league as Bjorn so can’t think of any myself, but if anyone does have any ideas, feel free to suggest them through the comments.